Feeling lucky comrade? 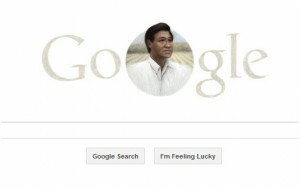 It’s exactly what you would expect from Google, whose motto is “Don’t be evil.” If they ever meant that, they failed miserably as proven by today’s home page which honors Socialist Cesar Chavez on Easter Sunday. It is a slap in the face to every Christian on the planet and is just downright evilly blasphemous. Google has been known for dissing the Founder’s birthdays and American history in favor of Marxist ideals and Islamic tradition. This time, they really let their mask fall. 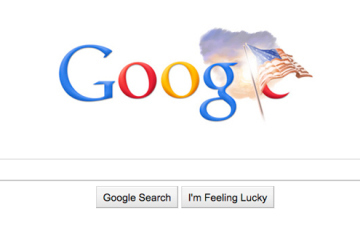 TIME Newsfeed – Veteran’s Day 2010 Here is a link to Google’s Doodles. Let’s just say it is enlightening. At least Bing was not as bad – they displayed a beautiful picture of Ukrainian Easter Eggs for their chosen page today. I can live with that – but an avowed Alinsky Socialist who was honored by our Marxist president? That just pisses me off. I’m not the only one either. The late Cesar Chavez was a labor organizer who founded the United Farm Workers Union. President Barack Obama released a statement in 2011 proclaiming March 31st “Cesar Chavez Day,” declaring, “I call upon all Americans to observe this day with appropriate service, community, and educational programs to honor Cesar Chavez’s enduring legacy.” It’s his 86th birthday and all the Marxists are celebrating one of the premier community organizers of their lifetimes. In 1947, Saul Alinsky hired Fred Ross, an experienced organizer among California’s migrant farmworkers. Ross built the Community Service Organization in several cities, mostly among Latinos, recruiting new members and identifying potential leaders through house meetings and one-on-one conversations. In San Jose, California, one of the people Ross recruited was César Chávez, whom Ross hired and trained as an organizer. Chávez would later adopt these organizing ideas in starting the United Farm Workers union. Chavez linked arms with Communist Party USA members such as Bert Corona. He was closely tied to Democratic Socialists of America as well. Trained for several years in Chicago, by the great agitator Saul Alinsky, an inspiration to DSA, Hillary Clinton and Obama himself, Cesar Chavez worked with communists and socialists his entire career. Chavez marched under the infamous slogan “Si se puede!” – later translated into English to become Obama’s 2008 campaign slogan “Yes we can!” Many of the same radicals that marched with Chavez wound up working with Barack Obama. An identical Marxist ideology was carried forward into the Obama Administration. Among the biggest names in the Alinsky/communist/socialist movement include former Obama Labor Secretary Hilda Solis, DSA icon Dolores Huerta and Los Angeles Mayor Anthony Villaraigosa. California’s 32nd District Rep. Judy Chu also has Chavez ties and was a long-time affiliate of the now defunct Communist Workers Party. I have long said that if you can, don’t use Google. Use Bing or another search engine. Google is so prevalent though, it is difficult to do this. If you are a Christian or a Conservative Constitutionalist, your principles may dictate that you find a way to get away from this Marxist propaganda tool that is being wielded by Obama and his cronies. Some will say Google is doing this just to get attention. No, they don’t need the attention. This is who they are. Google has only once honored Easter and that was in 2000. Must have been a slow year for Marxists. So, let me get this straight… Google, which is a propaganda arm for Obama, celebrates a socialist radical and disses Easter and the Resurrection. That is Google’s right and it is our right to tell them to pound sand and go elsewhere. Bing is looking better and better these days. Google can, and likely will switch out to an Easter logo sometime today. But as millions of Christians return home from Easter vigil on the holiest day of their calendar, they are currently being greeted by Cesar Chavez in a white suit. Remember, Obama, the Department of Education and the Common Core Standards are teaching in our schools that Cesar Chavez is a “hero of the people.” Only if you are Marxist is this true. And now you see the U.S. government in true fascist style, place ideologues over faith. Every time I see pictures such as Cesar Chavez or more commonly Barack Obama’s arrogant visage, I see snapshots of Stalin, Mao, Lenin and Hitler in my mind’s eye. The faces have changed, but not the Google evil message.